Massachusetts Oyster Project: Mass Oyster Hat in Florida! Global traveler and medical marketer extraordinaire Lisa F. who works for Billerica, MA based Belmont Instrument sent us this photo of her wearing her MOP hat at Leffis Key sanctuary in sunny Manatee County, Florida. Not only does it help protect her from skin cancer, but also it contains an important catch phrase "An oyster filters 30 gallons of water per day." Lisa often wears her hat while kayaking in the preserve and visiting an oyster reef located nearby. 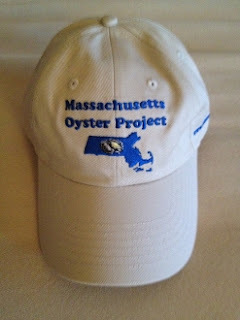 To order your MOP hat go to the Mass Oyster Store.